If you are seduced by what is happening in the technology end of art and have been dabbling in fantasy, monsters, and gaming animation, this book may be a little shallow for your needs. But if you are a novice and toying with the decision of where to focus your talent and are curious about what instruments of art and technology are brought to bear in the creation of these art genres, this IS the book for you. It is a great introduction to tools of the trade, whether creating as a fine artist, or preparing to become a tech wizard of illustration and graphics software. It gives enough information to experiment with different mediums of fine art; but it loses some thrust when it moves into digital technology. As anyone who has limited experience in the Adobe Creative Suite knows, these types of programs are not user friendly and require considerable training to master with regard to creating original art; they cannot be mastered in five pages. However there are some useful hints offered by the editors. They speak frankly about all currently used tools, techniques and advantages or disadvantages. For example, they suggest giving serious thought to the purchase of a graphics pad and stylus over attempting to draw with the mouse, but they also point out that the whole problem of preliminary sketching can be avoided by scanning a hand-drawn image directly into a graphics program. The editors do a fine job of explaining how many of the artists’ tools work, and how to move hand-created illustrations into digital territory. But the intent of the book is a bit overambitious for a mere 192 pages. 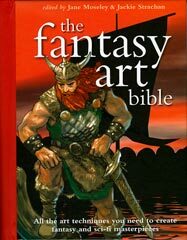 I also found that the art out-performed the textual information in most cases, and the book cannot really replace any art or technology manuals one might have lying about; however, it is a nice supplement, and offers a great deal to the novice just starting to figure things out. It is also conveniently spiral bound for easy use. For a book currently showing up on discount tables, now is the time to pounce. I give this a dual rating: three tentacles out of five for the novice; one tentacle for the more established artist who has probably already rooted out this information from other sources. sounds rather helpful and useful!